Okay, so this really isn't an outfit outfit. But since this is something I've actually worn, I'm making you look at these pictures. I wear all black pretty often; it's my go-to when I am running late for work and I don't know what to wear. 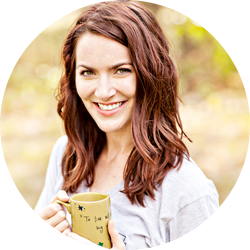 It easy, you don't have to worry about complimentary colors, and it looks professional. I've mentioned it before, but winter is not my favorite. I just hate being cold, and I hate the fact that it's always so dark and gloomy. It probably sounds silly, but having a bright coat helps a little. 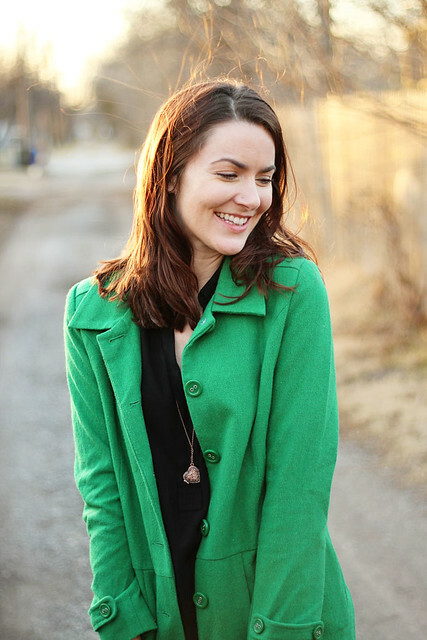 Since green is my favorite color, this coat is a little bit of happy for me on bleary days. What about you? Do you have any clothing items that make you happy in the winter? What's your go-to professional outfit? I love green! That coat is so fun. I need a good long cardigan, scarves, and riding boots! Agreed! A bright coat is so much more cheerful than standard black in a gloomy winter! That green is lovely. Love this bold coat! And the black outfit really lets the coat have all the attention! Such a cute outfit! I love how the green brightens up all the black. I think I might have to try this look out! I love, love color in winter. Why should we dress as dreary as the sky? I also am a fan of all black with a bright color. That's a beautiful coat, Ashley! Sure to brighten up a dull winter day! And even I'm not a winter person_ can't stand the cold! I love the green coat! I actually have a similar coat and I never remember to wear it. I need to pull it out of the closet! I love that coat! I have a bright red one and it makes me feel slightly less blah when I'm wearing my typical winter color scheme of black and grey. 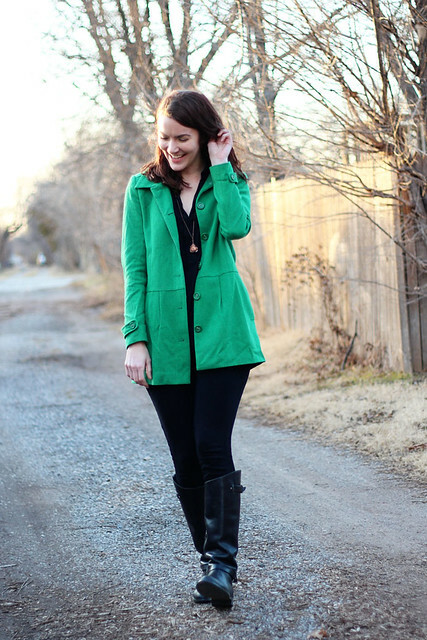 Love that bright green coat! I really like to wear bright coats to make me feel better about the cold. It helps a little. I hate winter too! But your outfit is cute, so that makes up for it. My winter coat is red! The color of this coat is PERFECTION! You are just glowing, Ashley! Love how chic your looks always are! All black everything is always an easy and good look. Plus it's slimming. :-) I like that shade of green. It's my mom's favorite color too. The pop of green is fab! I love colored coats!! And I love how you wore all back so the coat can shine :) Thanks for stopping by Just Jilly!! Your coat really pops against the black! It's so cute! I would love to add a colored coat to my closet. They are so much fun while still being practical. Winter needs more color! I'm a big fan of neutrals with a pop of color, I love it! I love adding lots of color to my ensembles in the winter - it tricks me into forgetting that it's so gloomy outside. :) Loving that green on you! so so cute! that color green looks great on you! Having an abundance of bright, fun outerwear is the only thing I like about winter. It's essential to my mental well being on these cold, dark days. 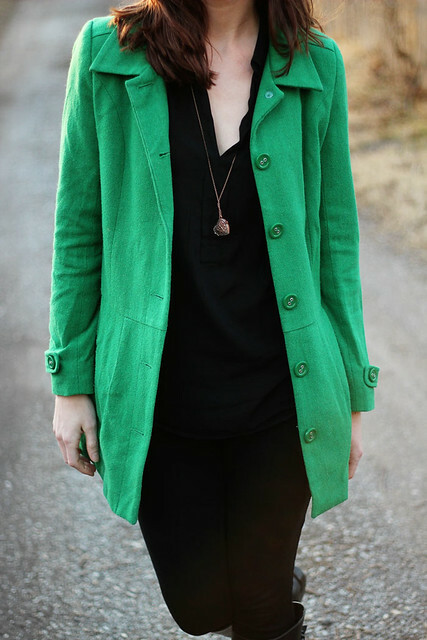 i love this beautiful green coat! I wear all black a lot too, and absolutely agree that a pop of color adds so much to an outfit. Ugh! I love that kelly green jacket! The perfect pop of color!! Really love the green coat! Such a gorgeous shade!